About a week before the Demo, the Demonstratorcontacted me to say that currently I was the only person booked on that date. She would only run it with a minimum of 2 people – did I have anyone else who would come along? I didn’t want to ask MH (my husband) to trog over to Chiswick to see this machine. Actually I didn’t want him to seeit at all until I had it straight in my mind. I could have asked my brother, who is a Vitamix devotee, but I wanted to keep him in reserve for when I had a Thermomix demo at home. So, I asked my aunt Joy if she would come along with me. To my delight, she agreed. She has a Vitamix too, so would probably enjoy the demo. A couple of days before the Demo, I discovered I had chicken pox. I had to cancel the demo (and cancel lots of other things, but that’s not part of this Blog). I told Natarsha (the Demonstrator) that I would re-book later. The chicken pox took nearly 3 weeks. I had kept my eye on the Demonstrator dates page on the Thermomix website, but there weren’t many dates offered. I wondered what was going on. I wondered whether it was to do with the possible imminent arrival of a new model? I emailed them to ask. Turns out they weren’t updating the page anymore, and should have removed it. Natarsha kept her own website and Facebook page, and I watched the dates on there. I wanted a weekday daytime session. There weren’t any. At least, not for public demos. She offered lots of public demos at weekends, at evenings…; lots of demonstrator open days, and training days…. No convenient dates appeared. I wondered whether maybe I should just have a demo at my house, and forget the idea of me going to one first? I looked at our diaries. I emailed Natarsha to ask if she could switch a specific one of her daytime public demos (if it didn’t have any attendees of course) to a private demo at my house. I promised to invite other people as well. That wasn’t possible, as the date for the public demo was widely publicised. As an alternative, Natarsha asked if maybe MH and I could go to her public demo, and then have a separate demo at my house later? Not possible on this particular date as I had a commitment later in the day and wouldn’t be able to get back in time. Maybe it was fate, and I should put the money I had saved up to better use. I looked for other dates at her house from myself and MH, thinking I’d have a private demo as well in August/September. I found a date at the end of July, and emailed to book two places. Booking confirmed…but just in case I was thinking of buying a Thermomix, there was an offer on which ended on 25th July. A whole bundle of cookbooks (value £107) were being included, and there hadn’t been such an offer ever. I looked back over previous offers, and Natarsha was right. Instead of thinking “Wow, must do this”, it had the opposite effect. My suspicions were raised. 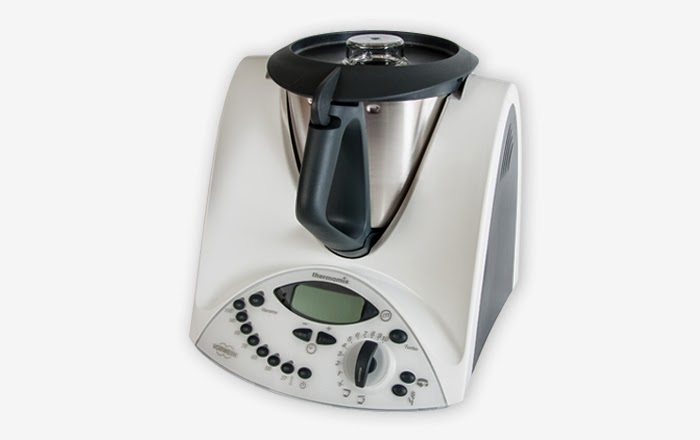 Was this Thermomix clearing the decks of old stock in anticipation of a new model being released? There was even more speculation about this online, with someone or other presenting evidence of Thermomix visiting the Australian HQ in August, and all Aussie Demonstrator training cancelled in August. Thermomix is huge in Australia, so it would be one of their launch markets. Well, I wasn’t going to buy a Thermie now, was I? I’d rather wait until September and get the speculated new model. There didn’t seem any point in changing the demo. But then…what if I saw it and wanted to buy it, I’d kick myself for missing the offer. OK, perhaps the best thing would be to book a date before the offer expired, and then at least I’d have the choice. I emailed Natarsha again, and we agreed a date earlier in July. I needed a couple of extra people there, and if I could get 3 separate households new to Thermie (excluding us) then I’d get a host gift. I wasn’t too fussed about that, I’d read about the cheap tea towels etc that were offered and I didn’t need anything like that. So, we had a date, and I just needed to invite some other people. If I still worked in an office, I’d have had lots of people to invite. But I didn’t, and I didn’t know that many people who would be free on a weekday day and might be interested in seeing the demo. The people I could invite probably wouldn’t be interested in a Thermomix (and would probably think I was off my head for contemplating spending all that money on a glorified blender). And then I realised I’d booked the demo for the same day that we were meant to be going to see Monty Python.